Fishermen bought popeye mullet in a fish market as fresh bait. The beautiful beach was right where the Rocks are now, across from the Museum at Ft. Fisher – bigger than Carolina Beach, but inaccessible. You couldn’t get a parking place and you had cliffs. They are working a haul seine to catch popeye mullet. The boat went out around the mullet with the net and came in up here. Everybody pulled the net in by physical strength. Some had mules or tractors. A haul seine takes a crew from 20 to 23 men. You have to do it at night so the fishermen would see one, jump out of the boat and hold this staff. They caught like 6,000 pounds for commercial use. You sold Popeye mullet to the wholesale houses and they sold to the retail stores. 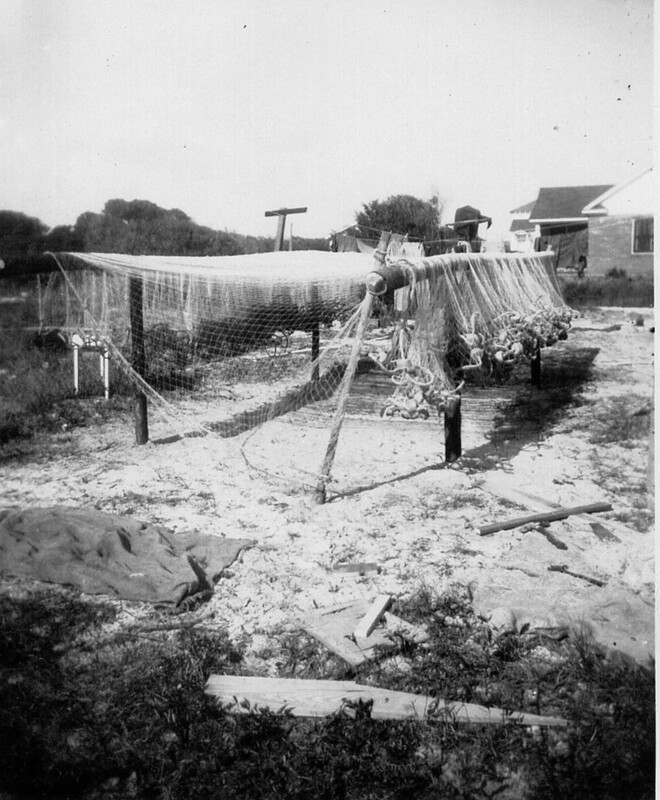 Gill net – There’s a difference between a haul seine and a gill net. One man can work a gill net. Here’s a gill hanging out to dry – 150 yards long – longer than a football field. Fish get hung up in it in their gills. And they can’t back out. Earl did this after he came out of the Navy in World War II. It takes two gill netters with two boats that come together back at the stern, stern to stern, and both netters go like this with one man in each boat.